"Psst, you're running low on toilet paper." Same-day delivery is too slow. Amazon has obtained a patent on anticipatory shipping, claiming it knows its customers so well it can pack and ship merchandise before customers order it. So-called "smart refrigerators" and other household appliances may not be so smart. 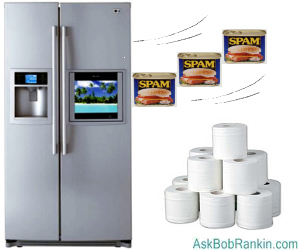 According to security research firm Proofpoint, one WiFi-connected refrigerator was hijacked and used in a network that also included smart TV sets, to send over 750,000 spam emails in a recent botnet exploit. This brings us one step closer to digital delivery of frozen pizza. "Back by popular demand: Windows 7 PCs!" So says the HP Home & Home Office Store landing page in an unusually candid break from HP's close partner, Microsoft. I also found Win7 systems at Dell and Lenovo, but not at Gateway, Acer or ASUS. Adware pushers are offering developers of popular Chrome browser extensions "six figures a month" for the right to inject their malware into established, trusted extensions such as Honey, Tweet This Page, and an RSS extension for Feedly. Google is responding by pulling subverted extensions from its store and tightening up developer requirements. Why did Google, the search company, pay $3.2 billion in cash for Nest, a maker of "smart" home thermostats? Probably for the same reason Google is rolling out Google Fiber across the country. It wants to be a part of any activity through which data about people and their activities are gathered. Is Microsoft paying YouTube pundits to endorse the Xbox One? Forbes magazine poses that question and kinda, sorta answers it, "yes… not that there's anything wrong with that." Messaging app "WhatsApp" racked up 30 million new users in a single month, topping 430 million monthly users in total. That's twice the number of Twitter users, and with 50 billion new messages sent each day, WhatsApp rivals all SMS traffic. "Horizon" wins iOS app of the year; forget the next eleven months, it's over. This product of developer Evil Window Dog ends the accursed Vertical Video Syndrome, allowing – forcing, really – users to shoot horizontally oriented videos no matter how they hold their camera-equipped devices. You weren't expecting a personal matchmaking service when you called your phone company's tech support number, but that's what you may have gotten without even knowing it. Mattersight is an artificial-intelligence system that deduces customers' personality types from their voices and interactions with voice-response systems, and matches them up with compatible customer service agents. In theory, anyway. Most recent comments on "Geekly Update - 22 January 2014"
When I heard that Amazon can read my mind and ship things out to me before ordering them, I thought to myself, there will some legal issues. If I received something from a place like Amazon that I didn't order, I would just put it on the box, "Refused, Return to Send". Also notify my bank and advise them what Amazon did, so they can charge the amount back to Amazon. I had this happen about 2 yrs ago. Can anyone explain to me why I might ever want my refrigerator to be connected to the internet? This seems to me to be the gratuitous extension of IT technology into areas where it is wholly unnecessary, so although normally I disapprove vehemently of hackers, this time I actually find it rather amusing that someone has subverted it. I have Windows 7 and 8 on my machine, dual boot. The 8 files keep the disk balanced so it doesn't wobble -- sort of like balancing tires on your car. A connected refrigerator can monitor how much beer you have, and send an order to the grocery store when you run low. Personally, I can keep track of my refrigerator's contents easily enough. But keeping track of when I need to pump my septic tank is another matter. A toilet connected to the internet would be able to monitor usage and contact the service company automatically, relieving me of that chore. Hey, Alex...it's so your refrigerator can tell you if the milk is going sour and you need to buy more, by texting you on your cell phone. How does it know? The milk tells it via a chip imbedded in that transparent plastic. What I haven't figured out yet is why you need a "smart" TV when the available content just keeps getting dumber?